Gummy body parts. You get an assortment of gummy eyes, fingers, foot, ear and gummy brains. 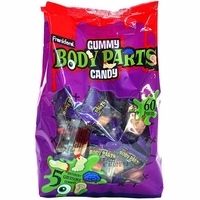 Fruit flavored gummy candy in the shape of body parts that not only taste good, but are fat free. Each bag has 60 individually wrapped gummi body parts.